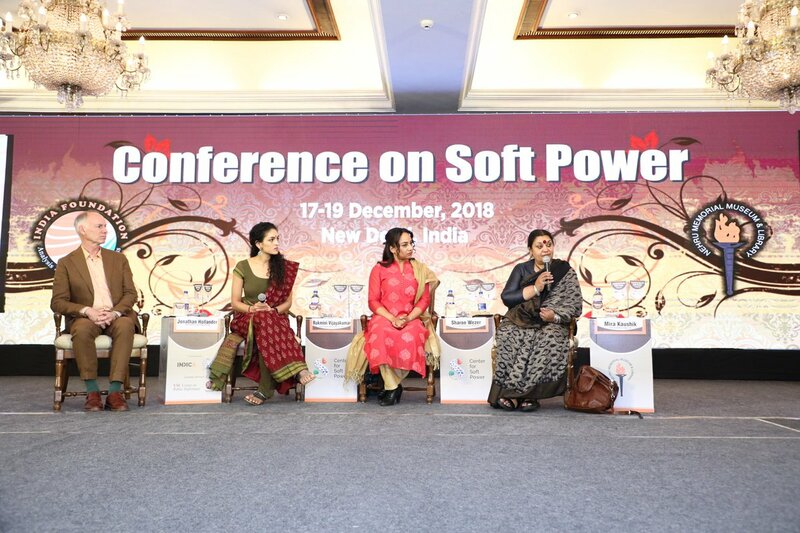 In December Akademi’s Artistic Director, Mira Kaushik, was invited to speak at the first International Conference on Soft Power hosted by India Foundation in collaboration with Nehru Memorial Museum and Library, in New Delhi. 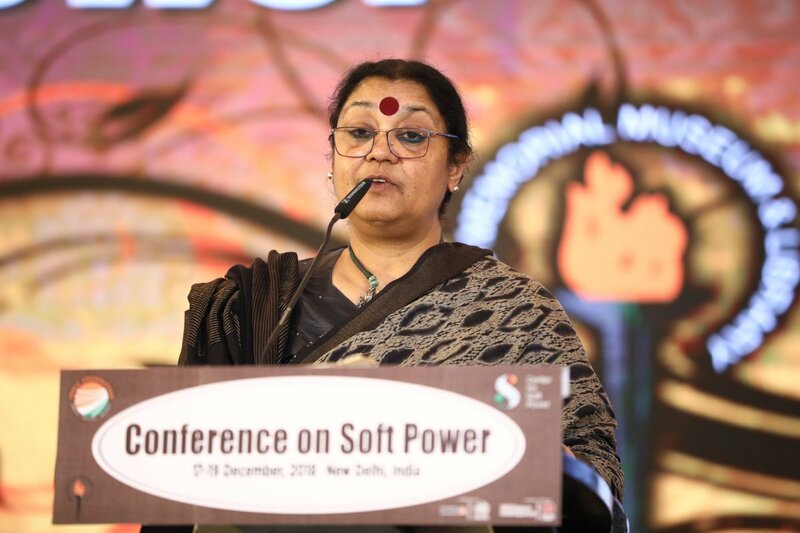 The aim of the conference was to bring together academicians, practioners, experts, policy makers and diplomats to deliberate and discuss Indian soft power. You can watch Mira’s talk online, or read the extended transcript of the talk below. Thank you for inviting me to this session. I am here to share my 30 years of experience of working of Indian art and culture within a European context. I am Director of Akademi and which is also part of the great campaign about which we heard of in the morning session. Akademi is a London based organisation which is funded by the taxpayers of the UK. So, my work is British – yet rooted in India. It is framed within the ever evolving artistic, social educational and economic context of contemporary Britain; which is currently recovering from the 8 years of austerity and battles of Brexit (which is ongoing for us). Akademi does not create a mini India in the UK – we Indianise the west (in reverse of the way India is getting westernised) I take India to the west; that is the basic principle. While working with Indian art in Britain we are also woven into the creative tapestry of the creative sector of Britain, we are not an Indian patch in London – these are two metaphors that I use. Akademi is a unique, creative interface between Indian and British performing arts. Celebrating the plurality of dance in all of its forms and embracing excellence in classical, contemporary and popular dance styles from across the regions. Hundreds of years of India’s cultural and political associations and 40 years of Akademi’s own existence has led us to believe that we are an intrinsic part of the British culture and part of the British Creative DNA. The way ballet from Russia or Jazz from America has established itself into the local psyche. We inspire and change lives by creating and nurturing excellence in Indian dance. We have taken dance to unexpected, unconventional spaces (like underground vaults, forests, museums, hospital, community centres, Trafalgar Square, Somerset House, Houses of Parliament, to Buckingham Palace. We have redefined the parameters of the artform itself by inspiring audiences, developing artists and changing lives. We are a dynamic, future facing body, where Indian dance connects with the wider contemporary arts sector. Almost a finishing school for young Indian dancers. A spring board for the large section of the artists – our programme brings Indian dance to the mainstream attention, capturing the Indian imagination through inspired storytelling and unique spectacles. We create vitally important pathways for the exceptionally talented artists and every week they are found in the heart of the community, creating life affirming experiences for those who are disadvantaged, disengaged and isolated. We develop artists, artforms and the use of the artform to connect with the life of the UK. We also have a thriving commercial arm as well which creates amazing, exclusive and entertaining experiences. Over the last three years we have reached live audiences of 190,000 people with 151 performances delivered 339 workshops with 7500 attendees and provided 300 + artist development opportunities. While thinking about this conference – I needed to be clear about the purpose of asserting our soft power to the world – since there would be different solutions to different situations. From the previous speakes I have heard that we need to assert out soft power to gain borderless mind space, assert our foreign policy and to cut terrorism. The frame work of our culture, value, inherent knowledge and wisdom needs a variety of strategies to deal with these global issues. I would like to share my one particular experience of producing Usne Kaha Tha / The Troth – which was created this year and brought to India as part of Akademi’s India strategy (just have a think about me – an Indian national in the UK– coming up with an Indian strategy!) This strategy celebrated 70 years of Independence, Centenary of WW1, Indian Cinema and the story Usne Kaha Tha. Usne Kaha Tha is an Indian story written 100 years ago by Chandradhar Sharma Gulari. It is the greatest love story of an Indian soldier who served in World War 1. 60,000 Indians of an undivided India died 100 years ago serving Britain. To mark our contribution I decided to pick up this story and create a British Contemporary Show (not an Indian show – it was a western contemporary show) which was performed live; a living silent, black and white film with Hindi subtitles…..how did I do it? This was a British product created for a specific Indian market. India is one of the biggest markets for global business, UK trade and investment had set up a Re Imagine India funding pot to enhance their ambition and soft power. ReImagine India happened as part of the 70th Anniversary of our independence. This funding was made available in collaboration with the British Council. I was also fortunate to bring several trusts and foundations, Indian Council for Cultural relations, Ministry of Culture and three Indian state government came on board to tour this show. It was premiered at the Jaipur Literature festival in the courtyard of Hawa Mahal and had its finale at the Rashtrapati Bhavan on 13 February in front of the members of the cabinet and one hundred war veterans. Eventually this show was picked up by the British Army and we are still touring in the UK on behalf of the Army to speak about the India’s contribution in WW1. I think this one of the best experiences of diplomacy, internal or external that I could engage with such a wide range of partners. This show has already won three global mainstream awards for its artistry. I have been invited by several business platforms to talk about this experience in how to successfully reach India’s second tier cities in their own cultural term in Britain. I would like to suggest a reversal to this gathering and on what India could learn from this small and humble experience that I have had. I think we need to study and compare our cultural solutions, strategies with other competitors especially China and now Pakistan which has become more culturally active with its new leadership. We do an honest swat analysis and be professional in dealing with our weaknesses, as well as being SMART in celebrating our strengths and turn our threats into opportunities and milk them! Awareness and empathy with what already exist in India and current global trends, make effort to establish partnerships with relevant players by utilising our existing resources better. Strategic thinking and research is needed to make better use of the existing bodies like the National School of Drama/Repertory where investment is currently granted. ICCR and the Cultural Ministry need to work together with private and public collaborations to and be very clear about which brand of India which is being marketed; focus on quality, training, excellence and investment. Digitisation (we have spoken about) do few things better, well, in a consolidated form, to reflect our ambitions. Communicate and engage more with the people working outside of India more (I am pitching myself – and all of us actually) by creating a database and regular engagement with us. Vision with a focus to regularly train and support the team responsible for implementation of the vision. I have realised that there is very little investment done internally to train staff which is engaging in the implementation of cultural agendas – diplomates are brilliant, but supporting junior staff need continual professional development. Indian dance and cultural sector is generally run by monasteries, established by gurus, I would like to suggest– and this is my last suggestion – professionalisation of the creative world, through investment in it’s the process and making of the work. I would like to recommend that the Government of India sets up National School of Dance and a repertory company attached to it which can be toured internationally. India has National School of Drama, National Institute of Design, and a National Film School but no National School of Dance! We to deal with specific dance schools but we require one holistic vision to enhance what we create and global audience experiences. I would like to end with a film which is a fun film that my education department created for health and wellbeing and that food was a major part of that project.